creating a unique “HUGO™ PEMF Sandwich”. This is the product you need to counteract our toxic world and feel GREAT! 3 Reasons Why HUGO™ Is the Best Choice! Our toxic world can be overwhelming, but with the use of the HUGO™, OUR BODY’S NATURAL HEALING SYSTEM is reenergized, rejuvenated and restored to optimal function allowing us to become reacquainted with our body’s own healing system. Allowing us to give back to our own body’s healing system what the accumulated toxic load has depleted. To see how The HUGO can revolutionize your practice, just give us a call. Or schedule a call at your convenience if you’d rather. 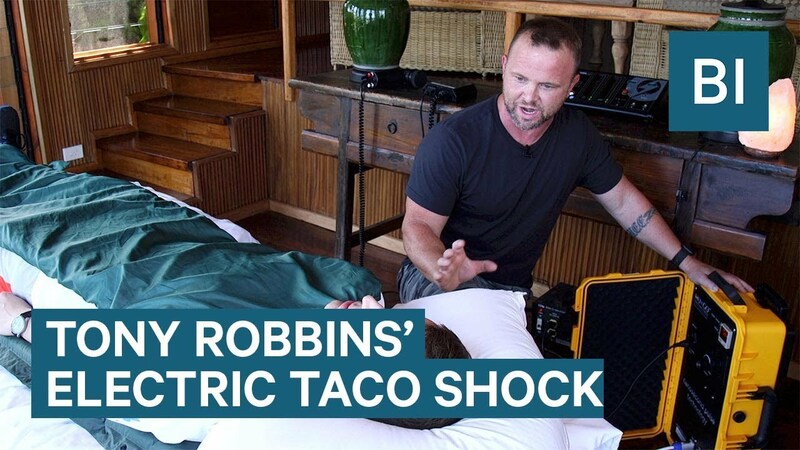 And just how important his "Electric Taco" is to him and his business! HUGO™ is the only nano-second spark gap PEMF device that offers the patent-pending HUGO™ Dual Full Body Mats delivering Pulsed Electromagnetic Fields above and below the body simultaneously. The unique design offers two full body mats, used above and below the body simultaneously. This allows the electromagnetic fields to home in on inflammation in the body and quickly dissipate the associated discomfort. With HUGO™ there is no doubt that it is working – you feel the pulsations. After the session you feel energized and euphoric, and you are tuned up to your body’s optimal cellular state. The HUGO™ is in the High Intensity Tesla class of bio-electromagnetic PEMF devices. HUGO™ employs the Tesla coil, with a spark gap between the capacitor and high voltage transformer which sets the standard for this class of PEMF devices. The Pulsed Electromagnetic Fields penetrate deeply into the body to the cellular level. PEMF has been shown to be completely safe apart from the contraindications listed. Water is electromagnetic in nature, and the water in the cells of our bodies function much like a cellular battery. The average adult human body averages around 57-60% water. Our cells function like tiny batteries – Dr. Gerald Pollack famously said: Our cells need charge like our cell phones need charge! When our cells become run down, they do not work optimally. The battery effect within the cells is due to tiny ion pumps created by the flow of sodium (Na+) and potassium (K+) ions inside and out of the cell membrane as well as the flow of calcium (Ca) and magnesium (Mg). The electrical charge of these tiny ion pumps depends on the health of the body, and they can be improved by using nano-second spark gap High Intensity PEMF for at most 12 minutes daily. So-called “Low intensity PEMF” devices do not work the same way, but use resonance aka oscillating magnetic fields with waveforms and frequencies (these are also referred to as “hummers”), these are not producing pulsed electromagnetic fields at all, they are resonanting/oscillating magnetic fields. These oscillating hummer type devices have different uses and applications, and they are much less expensive because of the type of components used. They work very differently energetically than High Intensity Pulsed Electromagnetic Field devices. The High Intensity nano-second spark gap PEMF is a true “pulsed” electromagnetic field that is strong enough to affect the cellular battery level and internal organs, these devices are referred to as “ringers”. When the cellular battery’s ion channels lose their electrical charge the flow of water and nutrients in, and cytotoxins out is slowed down. The body responds very well to nano-second spark gap PEMF technology because it boosts the cells batteries, promotes repair and provides antioxidant electrons which stop free radicals and promotes health and longevity and restores cell metabolism to a higher more optimally charged level. This action also benefits the immune system, circulation, removal of cellular wastes, and optimizes all the functions of the blood, lymph, facia and skeletal and nervous system at the cellular and organ levels. A person using the HUGO™ will feel the pulsations happening as the electromagnetic field seeks out and relieves every area of inflammation in the body. HUGO™ nano-second spark gap PEMF also optimizes the body’s natural self-healing and self-regulating functions. Healthy, energized cells have an optimal charge while run down cells can use a boost in their charge in order boost a person’s energy and healing system and promote longevity. the PEMF boost also benefits healthy DNA and RNA replication. When our cells are run down, we feel tired and sluggish and we are more vulnerable to dis-ease and accelerated aging. The PEMF boost also helps to prevent the formation of free radical attacks. This is very important because free radicals steal electrons from the cell creating more free radical damage in a vicious cycle. This protection from free radical attacks also benefits the immune system. The main benefit of using the Patent Pending HUGO™ dual mats together is lying in-between them. You could lie on just one mat and double the intensity with the dial on the driver, or you could take both mats and lie on top of both of them, either way, you will still be exposed to an amplified magnetic field… but… you won’t get the same benefit that you get from lying between the two mats. Magnetic fields get weak rapidly with distance, and the more matter they pass through. With the dual mat “sandwich”, the full strength of the field is placed on the back and front of the body at the same time, as opposed to just one side. Having a PEMF mat sandwich is doubling the strength of your magnetic field and equalizing the penetration of the field through the body. If you lie ONLY on the bottom mat, then only one side of your body is receiving the full strength of the magnetic field and with that field getting weaker as it passes through your body, the other side of your body is receiving a much weaker magnetic field. Having a PEMF mat underneath and on top of the body means that both sides are s of your body are receiving the same strength magnetic field simultaneously and this amplifies the magnetic field yielding a better flow of electrons. This promotes better overall health and wellbeing, boosts energy and improves mitochondrial function production of ATP. You want to help more people and increase ROI for your practice while doing it. The HUGO helps you do just that! Tell us how to get in touch and we’ll send you all the information you need to see how this device can help you and your patients optimize healing and feel great! Your Interest * Your InterestInterested in PricingJust General Information About The HUGO PEMFI would like information on where I can use the HUGO PEMFI already have a HUGO and would like to speak with someone. By submitting this form, Signature health, Ltd may contact me about their products and services. I understand I will be able to unsubscribe at a later time.